1: Jermain Defoe has finally arrived. It took the 36-year old a fair old time to get up to speed, and it was ‘only St Mirren’ but this was the first time he’s actually looked the part and made Ibrox Noise’s projections of his prospects look silly. He was strong, quick, hard-working, a good team player, a deft touch and used all his experience to completely outclass St Mirren’s backline. He was a little fortunate to be awarded the second penalty (we’re not sure how much contact there really was) but he showed huge improvement and even a potential to play as one up front. 2: Alfredo Morelos needs to grow up – once again playing with a petted lip, his reaction to not being given the third penalty sums his immaturity up. When he’s on fire he’s a £20M striker who causes mayhem for opponents, when he’s like this he’s a selfish brat who must quit the egocentrism. 3: Steven Davis is struggling with fitness, despite his claims otherwise – while his early play was polished, he started to derail badly and after a succession of crude fouls was rightly withdrawn. May be some time before we see his real form emerge. 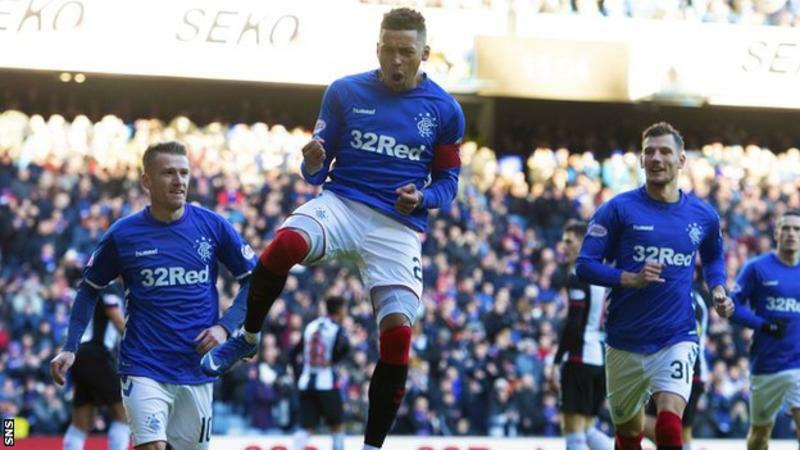 4: The Nikola Katic and Joe Worrall partnership really isn’t that bad – it’s conceded all of two goals in three outings, and was completely untroubled in this one – both put in good blocks and seemed to have a reasonable understanding. Steven Gerrard will be happy with how his youngest CBs are starting to develop. 5: Scott Arfield keeps showing just how important he is – his on ball and off ball work was pure team spirit and team ethic, and on top of the grit and determination is his classy play too. He is quietly one of the most important players in the squad. 6: The diamond doesn’t work. It’s simple – Rangers had to rely on three penalties plus a late formation change to win this one – midfield as a whole just isn’t clicking with this system, and Ryan Kent mostly hugged the left to be effective. Can we please just ditch this terrible system? 7: Gareth McAuley seems to have either drifted out the team picture of late or is being saved for Aberdeen – we were sure he’d feature in this one but he was nowhere to be seen. We’ll have more reaction in due course but for now, what were your thoughts? This team will not beat Aberdeen on Wednesday night. Just go back to the team that beat Celtic. Defoe wasn’t to bad but Davis can’t start on Wednesday. Agree 100% the Diamond doesn't work It's either Morelos or Defoe not both . Barasic looked more comfortable . Davis should start against the SS we need his experience . Kent in every week for me please . Laffs on the bench too. I can t say I was excited today about how we got 3 points but I will take them anyway. The fact we needed a pile of penalties against the bottom club does not go well for me. This is still poor stuff from us and unless we pull our socks up big time for our trip to the sheep we are in big Soapy. If we can't get the team to play the way we did against the East End beggers a defeat against the sheep we can definitely say goodbye to 55.